Holy Cross of San Antonio, a Catholic college preparatory co-ed middle and high school, welcomes the Most Rev. Oscar Cantú, D.D., Apostolic Administrator and Auxiliary Bishop of the Archdiocese of San Antonio. 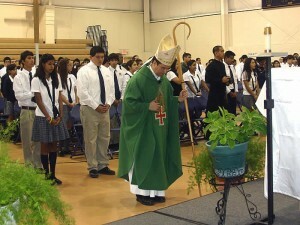 Bishop Cantú celebrated mass with the Holy Cross students and faculty on Oct. 12. Mr. Henry Galindo, Principal of Holy Cross of San Antonio, presented Bishop Cantú with a special gift of Blessed Brother André Bessette, C.S.C. who will be canonized on Oct. 17 by the Vatican. 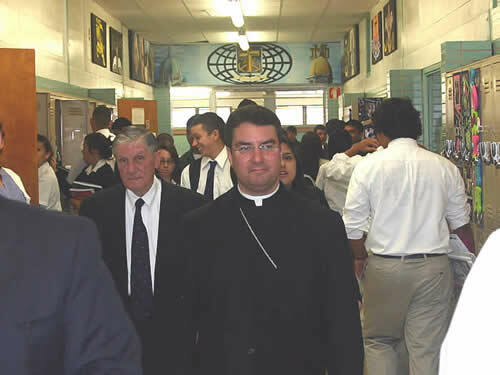 Bishop Cantú took a tour of the facilities, visited the Our Lady of Guadalupe grotto and visited the Holy Cross chapel.